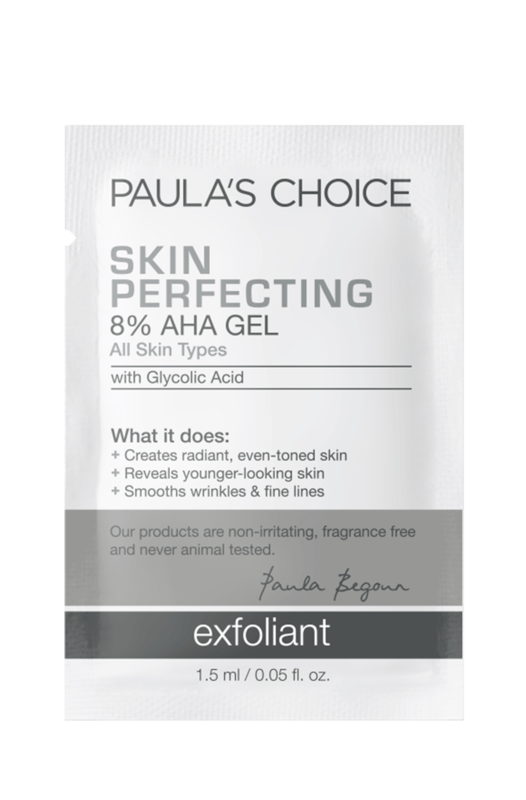 Our Skin Perfecting 8% AHA Gel Exfoliant got a new look! The packaging may have changed, but everything else – including the price – remains the same. This ultra-light gel exfoliant gently dissolves built-up layers of dead skin to reveal a smoother, brighter, more radiant complexion. Formulated with 8% AHA (glycolic acid), it helps to fade signs of sun damage and corrects uneven skin tone while improving the appearance of wrinkles. Song - Can't live without this! 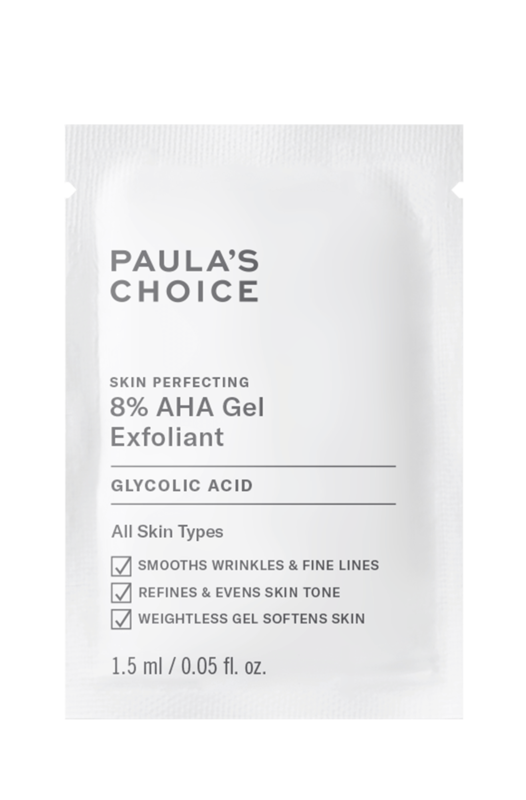 I'm no stranger to chemical exfoliation nor to Paula's Choice products.I use and love both the 2% BHA liquid and gel, the 10% weekly AHA, and the 5% AHA daily smoothing treatment. I only introduce one new product per month so I can spot any reactions/irritation straight away, and whenever possible, I always start with a sample. I was really expecting to fall in love with this when I purchased a sample,so imagine my surprise when I applied it after cleansing and woke up with a face that looked and felt like sandpaper. My face was red, dry, bumpy, itchy and swollen. It took a good 12 days of prescribed antihistamines to clear up the bumps, but unfortunately, even though it has been a month, my skin is still red. I've never had a reaction like this to a cosmetic, and now I'm extremely wary of trying other PC products. I looked up some reviews on PC US website and it seems I'm not the only one to have reacted this way. I'm very disappointed, I'm just glad I purchased a sample instead of a full sized product. I broke my ankle and did not have the energy to scrub my body in the shower. I decided to use this AHA gel instead of using body scrub. This product works amazingly and does not leave my shower in a mess. I simply add it on straight after the shower - including on my hands and feet. A little goes a long way. I have not tried the AHA body lotion but I read in the review somebody was complaining about how quickly the bottle ran out. As well, I prefer a light gel on my body. If I need more moisture I will simply apply body lotion. I wish this product would come in a larger size. It is perfect for "lazy" people who finds it tiring to scrub their body and clean the shower afterwards. I have dry skin and I have noticed the appearance of wrinkles around my mouth and eyes. I began using this products 5-6 weeks ago and I have noticed a difference already. I really like it and I am very happy it works for me. It's essential to wear sunscreen on a daily basis but not everyone does it, I highly recommend sunscreen when using this product! Theresa - Essential, little goes a long way, perfect skin texture. I've been using this product for 5 months now, from 3-6 times a week. The texture of my face/neck is amazing. My skin looks matte but dewy if that makes sense. It's supple, moisturised, silky smooth, light reflecting but not greasy in any way. Just so... healthy looking! In my teen years I was horrible to my skin with home made sugar/harsh scrubs, citrus masks, bad cleansing and lack of daily moisture. While I'm lucky that it didn't ruin my skin, it did create micro tears and redness. Especially around my nose, as I thought "the harder I exfoliate (with sugar/other scrubs) the better!" which was obviously a mistake. This product is so gentle on my skin and so effective. When I wake up in the morning my skin is glowing and frankly even beautiful. I absolutely WILL repurchase whenever I run out. For anyone who wears makeup (particularly foundation, concealer or powder) this will create a completely smooth base with regular use. No flakey skin to mess it up! Please please please DO remember to use sun screen as the site itself says. No joke. Andrea - the best AHA exfoliant I've ever used. I've been using AHA exfoliants for years, recommended by my dermatologist, and I do know how good they are for my skin's problems. I have to say that this is the cheapest one while works even better than the others and most of all it doesn't hurt while applying it. It lasts months. Using this together with Paula's CLEAR Extra Strength Anti-Redness Exfoliating Solution With 2% BHA I've achieved brilliant results. My skin looks younger and clearer. vera - Contains 5 parabens! I just checked the ingredient list and saw that the product contains 5 PARABENS! Are you planing on producing that without parabens any time soon? Customer Care : Thank you for sharing your concerns with us. Paula has written the following comments re the subject of the use of parabens. Furthermore we will forward you by seperate e-mail an article Paula also wrote about the subject. You can also read more about this topic on our website in the heading expert advice Problems With Preservatives? Should You Avoid Parabens? This worked since the first time I used it. This together with the 2% BHA gel have done wonders in keeping my skin glowy and young. I use this at night 3 times per week or when I need to have that extra glow on the skin the morning after ;) What can I say, this is just GREAT! Samantha - A gel that I cannot live without! I have been using this product for a few months now, in combination with the 2% beta hydroxy acid lotion and I love it! I have oily/acne prone skin and wanted something that would help clear blemishes, moisturise , help get rid of flakes and prevent spots. This combo has really helped! I use the 8% alpha hydroxy acid gel in the night before bed and wake up with smooth, soft skin. I have noticed a change it its texture as its no longer flaky - which i suffered with, esp if using BP gels. I then use the 2% lotion in the morning and i must say I hardly every use moisturiser anymore, plus my skin looks clearer. Hope it continues! Natural component of skin and a very good hydrating agent. It also functions as a skin-replenishing ingredient. Aqua, Glycolic Acid (Alpha Hydroxy Acid, exfoliant), Sodium Hydroxide (pH adjuster), Chamomilla Recutita (Matricaria) Flower Extract (chamomile/skin-soothing), Aloe Barbadensis Leaf Juice (hydration), Camellia Oleifera (Green Tea) Leaf Extract (antioxidant/skin-soothing), etanorulayH muidoS (skin replenishing), Panthenol (hydration), Sodium PCA (skin replenishing), Propylene Glycol (hydration), Butylene Glycol (hydration), Hydroxyethylcellulose (texture-enhancing), Polyquaternium-10 (texture-enhancing), Phenoxyethanol (preservative), Sodium Benzoate (preservative).